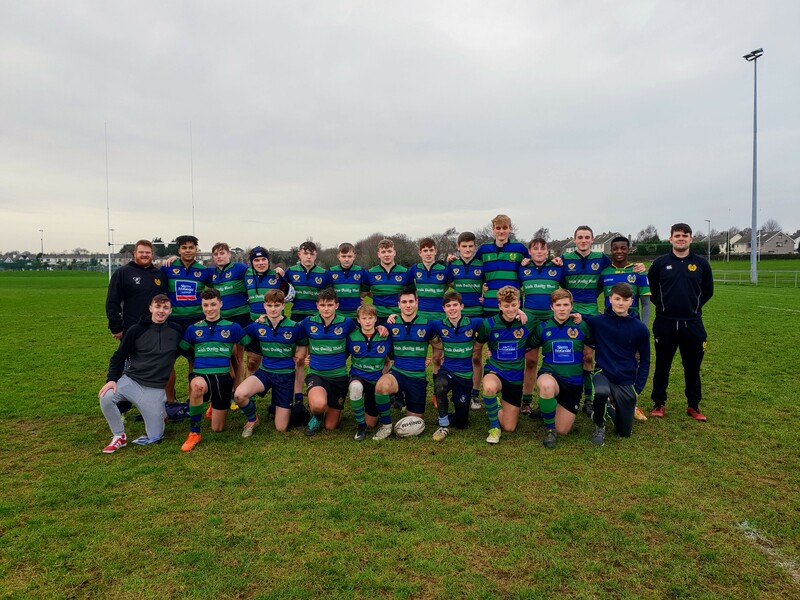 Our Seapoint U-17 team got their league campaign off to a promising start beating their local rivals Greystones with a convincing performance albeit somewhat flattered by the score line of 25 points to 7. The home team elected to play into a strong wind in the first half and spent a lot of time defending. Good organisation and resolute attitude ensuring that Greystone’s would have to work very hard for any scores in the first half. The starting Seapoint No 10 Oscar Lawlor had to leave the field after only 10 minutes of play with a badly bruised wrist. This forced a reshuffle within the backline with Stephen Manning stepping in to the No 10 position. Whilst Greystones had a lot of territorial advantage in the first half, they never really looked like breaching the Seapoint line and a rare Seapoint foray into the Greystones 22 shortly before half time resulted in a penalty kick which Manning duly converted. This left Seapoint with a 3 nil advantage at half time. The home team supporters were quietly confident that the wind advantage should get them a win in the second half. Sure enough shortly after half time Seapoint began to exert territorial pressure and after several forays into the Greystones John Ascough scored the first try of the game with a trademark quick tap and go from a penalty which Manning converted. However Greystones were not going to give up easily and shortly afterwards they managed to score a well worked try under the posts after a loose clearance kick by Seapoint from inside their own 22. This left the game in the balance at 10 points to 7 and Seapoint supporters were dismayed when Manning missed a relatively easy penalty kick shortly afterwards. However further pressure continued to be exerted by Seapoint which ultimately yielded another kickable penalty and this time Manning made no mistake. This left the scoreline at 13 points to 7 with about 10 minutes left on the clock. Greystone threw everything they had left into the remaining 15 minutes but clever play and resolute defence kept Seapoint in front and they scored two great tries in the closing 5 minutes to give them the final victory margin of 25 points to 7. One try was scored by John Ascough in the corner (his second of the match) and the closing try was a brilliant individual effort from Daragh McCaul scoring under the posts after a phenomenal burst right through the middle of the Greystones defence. Management made a specific decision not to award a man of the match because the overall team display was so good. Special mention to coaches Cian O’Gorman and Tom Kelly whose focus on organisation and patterns of play is starting to pay real dividends. Another great local derby in store next week as we travel away to our other neighbours DLSP. Well done team – a great performance and a deserved result.